Tickets for Steven Gerrard's final home game for Liverpool this weekend are on sale for more than £1,300. On Tuesday, the prices on ticketbis.net ranged from more than £100 to £1,324.64 before the captain's farewell against Crystal Palace at Anfield on Saturday. Tickets at that top price in the Main Stand normally sell at £47 for what is a Category C game. 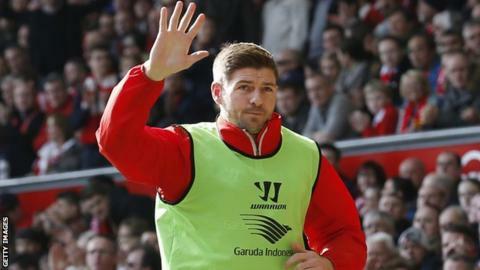 Gerrard, 34, ends a 17-year career with the Reds next week at Stoke, before he moves to MLS club LA Galaxy. Reports have suggested the former England skipper will receive a guard of honour before the match against the Eagles. A win for Liverpool in their final home game would secure a Europa League spot next season.